Amazon is taking its relationship with its customers to the next level. On Tuesday, Amazon announced that it is extending its Amazon Key delivery service from homes to personal vehicles. 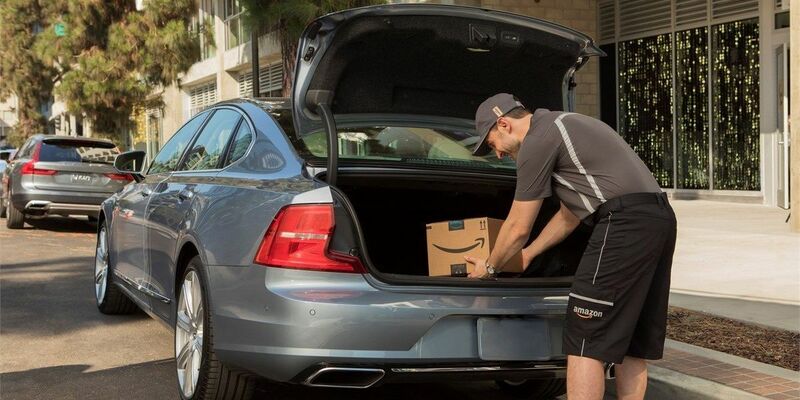 With Amazon Key In-Car, Amazon couriers will be able to deliver packages inside signed up customers’ cars. Amazon Key In Car isn’t available to everyone yet. It is enabled in 2015 or newer General Motors or Volvo vehicles equipped with cloud-connected technologies (OnStar and Volvo on Call, respectively). It’s only accessible to Prime members, and it has launched in 37 cities; Amazon customers can check whether they qualify here. Customers can sign up their vehicles through the Amazon Key app. Then, while shopping on Amazon, they can select their car as their chosen delivery method whenever they want to. Cars have to be parked within a two-block radius of a specified address, and can’t be in a multi-level, underground, or restricted-access parking garage. Amazon Key In-Car is an expansion of Amazon Key, which let couriers deliver packages directly inside people’s homes using keypad and smart locks and cameras. With Amazon Key, customers had to purchase the enabled keypads and cameras to qualify. But Amazon Key In-Car is available to anyone with OnStar or Volvo On Call access. Amazon has built in a number of safety features — which is a good thing considering the security hiccoughs they’ve already experienced with Amazon Key. In February of this year, an Amazon customer found an Amazon delivery man walking around his bedroom. And in November, security researchers found that a flaw in Amazon Key cameras made it vulnerable to being knocked out in an attack. Cameras aren’t available with Amazon Key In-Car. But customers will be able to monitor the delivery process step-by-step from their own devices. A delivery person’s request to unlock goes through Amazon, then to OnStar or Volvo On Call. And couriers won’t be able to move on to their next delivery until they have scanned the package confirming delivery, and locked the vehicle back up. Amazon, GM, and Volvo said that delivery people won’t be able to turn on or access any other electric features once they have access to the car. Volvo said that its cars equipped with Volvo On Call still need a physical key to actually drive it. GM said that OnStar-equipped vehicles also require a key to drive anywhere. And, additionally, that the capability for Amazon couriers to lock and unlock vehicles is completely isolated from the rest of OnStar’s services. “Select customers” have already had early access to the feature, and Amazon shockingly reports that they love it. So, if you trust Amazon enough to give it access to your home (as well as all of your data! ), Amazon Key In-Car could be an even more convenient option for you.